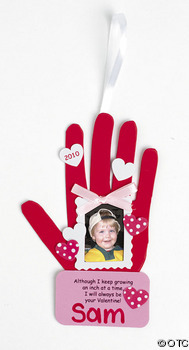 This 2010 Handprint Valentine Photo Frame Ornament Craft Kit will make 12 photo frames. It's the perfect craft activity for a kids Valentine's Day party. Let the kids make this photo frame at the party and then take it home as a party favor...or give each child a craft kit to take home as a party favor. Each kit comes in it's own individual package. You can also make these cute Valentine Day photo frames to give out to friends and family, of course, you will put a picture of your kids or your family in it first! Have fun with your kids making crafts together. Look how cute this handprint photo frame is, and imagine how cute your child's picture will look in it!